In this chapter, students will study the history and geography of the middle and southern colonies. Students will also learn about life in these colonies during the early 1700s. Check out the links below for additional information on this chapter. Unit 3 Family Letter - An overview of Unit 3 with reading suggestions. Chapter 6 Organizer - This is a copy of the blank chapter organizer and study guide (notes). This is due on the day of the chapter test. Early American Colonies - A study guide that details information about each early European settlement in America. 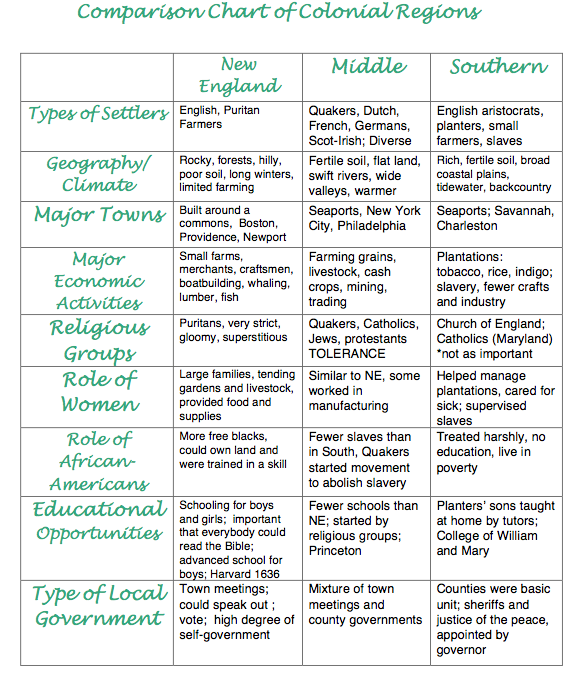 13 Colonies Chart - Comparison of colonies and regions. Colonial Ad - Create an advertisement for one of the 13 colonies.